A decaffeinated black tea full of flavour to refresh and revive at any time of day. Other flavours to complete the range are English Breakfast, Earl Grey, Green Tea with Jasmine, Green Tea, Peppermint, Lemon and Chamomile. 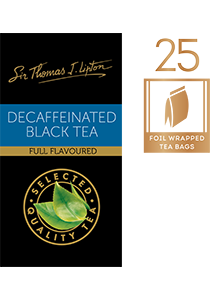 This decaffeinated blend is full of flavour, ideal for drinking any time of day.